I'm still working on editing my Las Vegas pictures (never mind the ones from my time in California as well as the 250+ that I went out and took yesterday!) 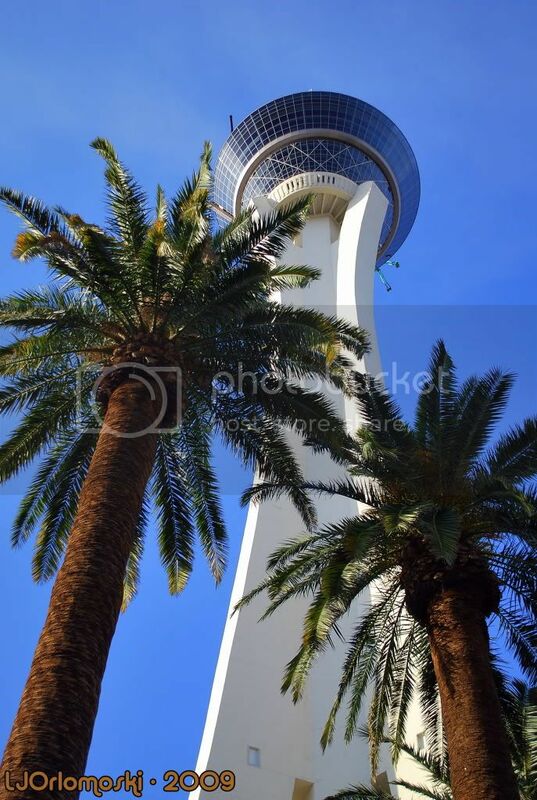 but I finally got a few done from our trip to the Stratosphere Hotel and Casino which boasts the tallest observation tower in the United States. At 1,149 feet it's definitely up there! 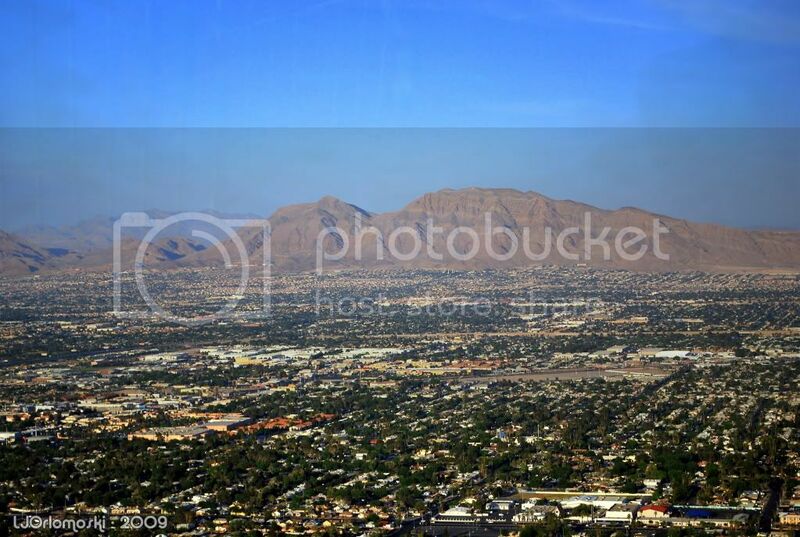 Our original plan had been to hit up the Stratosphere on Thursday but after watching the weather forecast on TV which called for high winds and possible rain on Thursday, I suggested to Jen that we head in that direction on Wednesday after conference sessions instead. 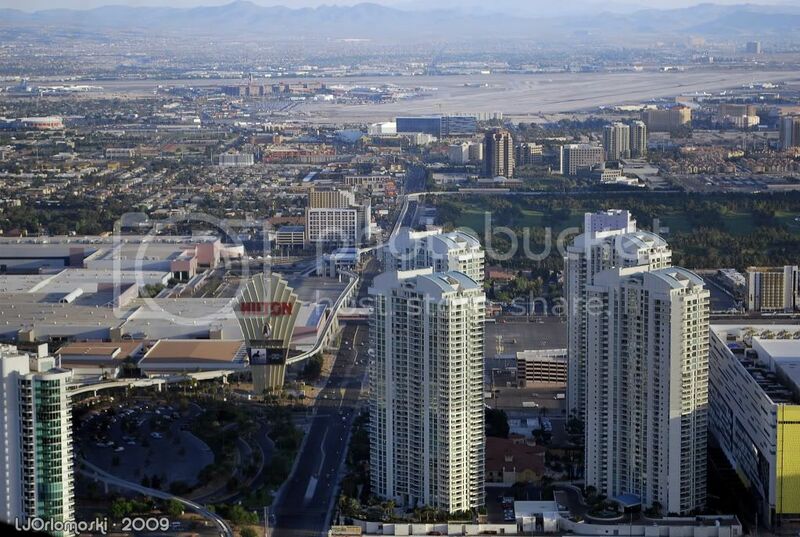 As you can tell from the pictures, Wednesday was absolutely beautiful and there was hardly even a breeze to speak of so it seemed like the perfect time to take a ride up the elevator and check out Vegas from a slightly higher than bird's eye view! 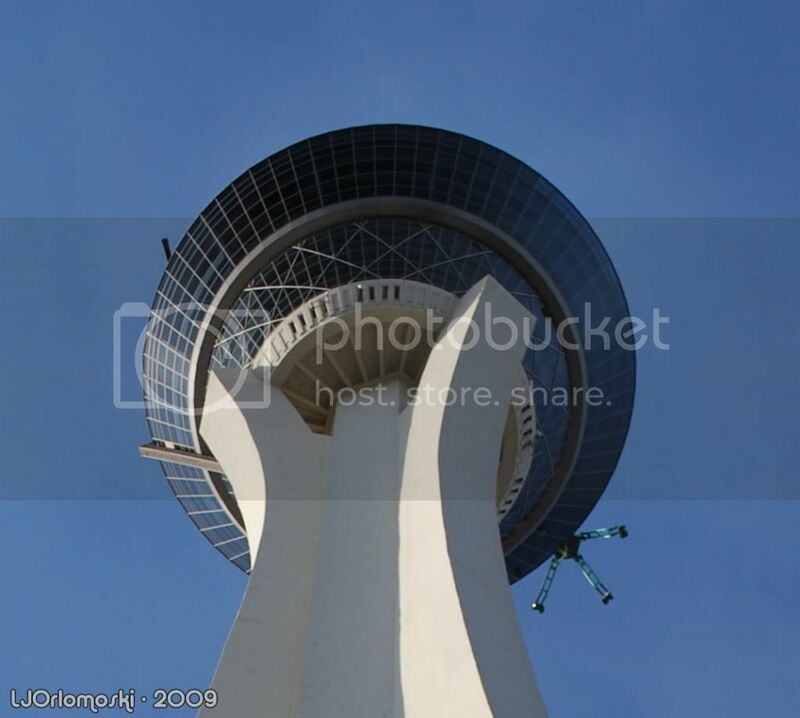 Originally we had thought about having dinner in the restaurant at the top of the tower but then decided that the prices were definitely in the stratosphere, too, so we decided to skip the experience. Nothing for nothing but $12 for a baked potato is a little out of my price range! Jen had it in her head that she was going to ride on the Big Shot which shoots riders an additional 160 feet up into the air via a burst of compressed air and I had it in my head that I was going to NOT do that. 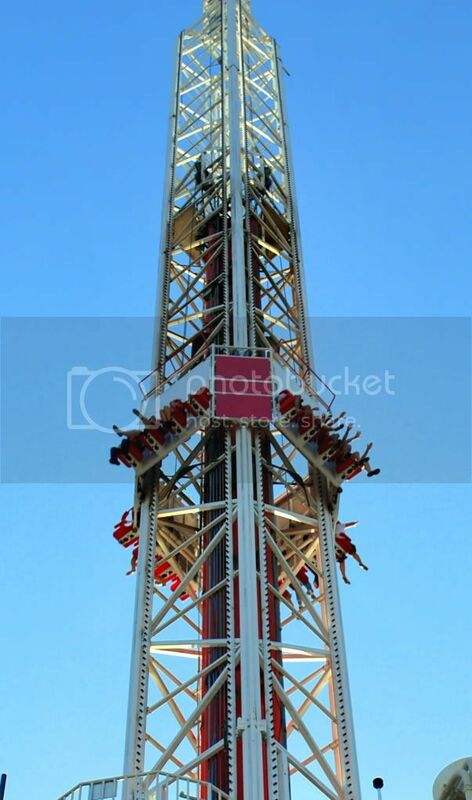 In addition to that whole fear of heights thing I have, I also had a great fear of messing up my back so even if I'd had a brief burst of insanity and thought I wanted to go on the ride, too, common sense prevailed from the lumbar region of my spine! After paying $13.95 to go up the tower (Jen's ticket cost $19.95 which included one ride on the Big Shot; compared to the $14 she paid for just the rollercoaster at New York New York it seemed to be quite the deal) we took the elevator to the 107th floor and parted company. While Jen made her way to a second elevator to take her up to the ride, I made my way up some stairs to the 109th floor observation deck to try to get some pictures. The picture on the left is the actual ride that Jen was on but she was on the other side from where I was standing and I don't think you can even see her legs as they are obstructed by the tower. She said the ride scared the beejeebers out of her but she was glad that she had been brave enough to go on it. The teenager in me who still hasn't quite gone into hiding briefly wished I had been able to go, too, but the old lady with the bad back knew better and swallowed the minor disappointment and went back to taking pictures! The views really were spectacular from the top of the tower and I wasn't as nervous as I thought I might have been but that's probably because I was too in awe of some of the crazy people who were walking around on top of that tower. You see, even though Jen was sort of crazy for going on the Big Shot, there were people that were going on rides that made the Big Shot look downright lame and tame. You see that octopus looking thing hanging over the right side of the tower? That's called Insanity, The Ride and it extends 64 feet over the edge of the tower and spins riders at a force of 3 Gs. They called it Insanity for a very good reason! Craziness, eh? Ah well, people looked like they were having a good time and after all, what's more fun than going on something that looks like it's going to splat you all over the sidewalk?!? Woohoo! How about you? Would you have the guts to go on any of these rides?? Not for love nor money! 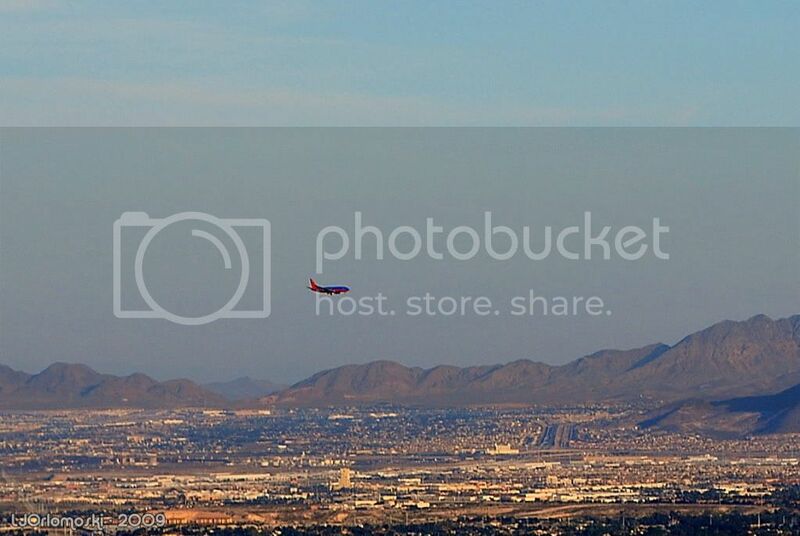 I doubt I'd have even gone up the elevator... 107th floor? Yikes! The highest I've been in an elevator was about 50 floors in a downtown office building. I couldn't wait to get out of that building! I remember being in Toronto while in HS. The CN Tower is really high. I got in the elevator (ok, I confess, I was pushed into the elevator), got up there, and looked out. I'm not one for heights. But once I'm there, I am usually okay. Yup $12 for a baked potato would be a bit out of my budget too. You certainly have some wonderful photos from your trip. It's funny to think of you enjoying 'our' weather. You can see why we love it. nope not me, i'd have stayed in and eaten the potato! I couldn't do these type of rides. I'm sitting here in my office watching the slide show and I'm feeling queasy. Yikes. OMG... just looking at the pictures makes my stomach do flip-flops!! No thank you. I would still be at ground level. My hat is off to you for going up to the 109th floor. Oh I so would do it all. I love that stuff. Your photo's are fantastic. I almost chucked up just looking at the pictures of those rides! Insanity is well named...one would have to be crazy to go on it! Go on the rides. Are you out of your freakin' mind woman? I didn't like the picture you took that looks straight down. Gulp! Now before the bad back, I did love rollar coasters, but those go up and down while attached to the ground. Nice sensible topography ... none of this, "And how do you feel about ungie cords, my dear?" blathering madness. Fab photos!!! Thirty years ago, yep, I'd go! My neck and better sense would prevail now... I'd love the view, though. My brother and sister would get a kick out of that place. Perhaps I should start saving up my money now so I can take a trip out to Vegas when they turn 21 (in two and a quarter years from now). Fun!!! And I've been there done that, and had all the fun I want in that regard! Gorgeous photos. 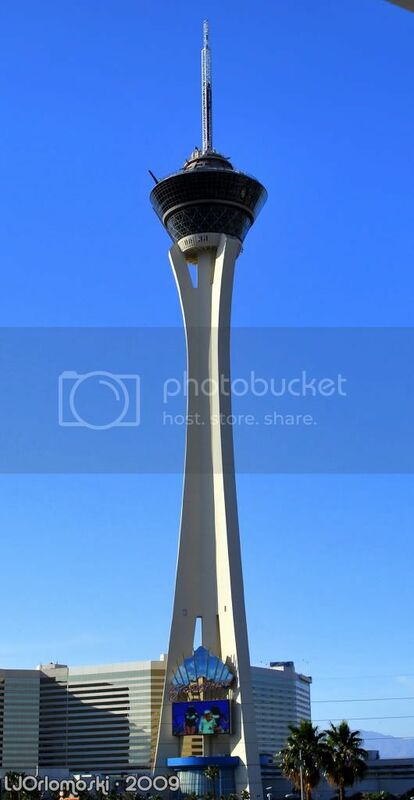 girl, I wouldn't even get on the elevator to the top of that thing! 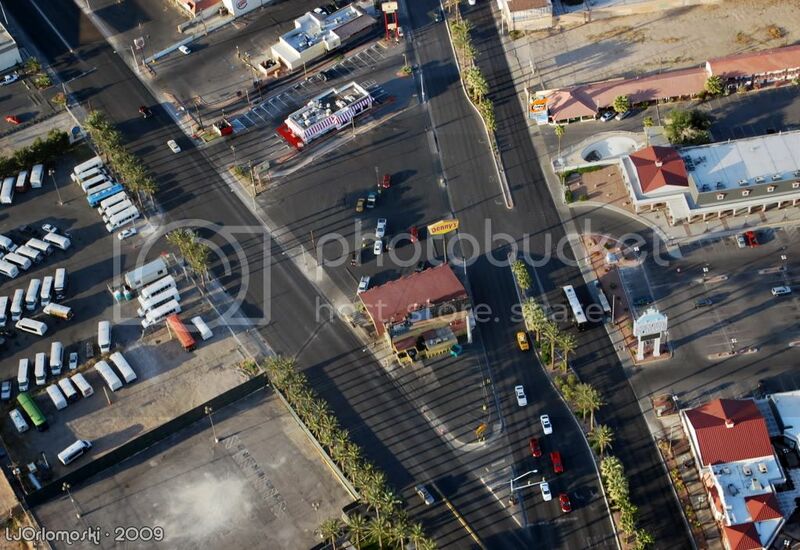 these are great pictures of Vegas!